Debt Free, Cashed Up and Laughing - The Cheapskates way to living the good life: Savings for Christmas - Next Year! Savings for Christmas - Next Year! I always love Boxing Day sales but not just for larger expensive items. I always head to my local Coles supermarket first thing in the morning to stock up on Christmas wrapping supplies to put aside for the following year. Most shops always reduce their Christmas stock on Boxing Day to clear. 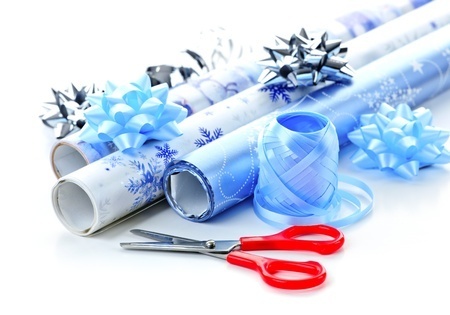 Wrapping paper, ribbons, bows, cards, gift tags etc. are all at least 50% off. This year however I found some great wrapping paper in plain colours without any Christmas designs or pictures on them. I purchased two 6m rolls, one in plain gold and one in plain silver for only $1.15 a roll and a 15m roll with blue and purple stars on it for only $1.74. Although these are in traditional Christmas colours they don't have any Christmas pictures or writing on them. I can use them for birthdays, Father's Days, Mother's Day, weddings etc. and for a fraction of the price. I also purchased ribbons and packets of bows for as little as 67 cents that although as also in Christmas colours - gold, silver, red, green, blue are equally suitable for other occasions. I saved about $30 in total. I Went Away for a Week…….